Apple Cider Vinegar For Gout – How To Use Apple Cider Vinegar To Treat Gout? Pearl Barley is a healthy food that has recently become popular. This food is more in love because it contains many nutrients and has a crunchy texture. So, we want to present how to cook pearl barley easily and simply. Pearl Barley is a grain that is harvested from ears barley. After the harvest, the husks are removed. When it is clean from the chaff, it is called “hulled barley”, “pot barley” and “dehulled barley”. Like that popular in America and England. In this condition, its still has a bran and this is can add nutritional value, but spend a lot of your time to cook it in the kitchen. The next process is remove the bran so that the grain is called “pearl barley”. After bran is cleaned, the grains will be shiny. 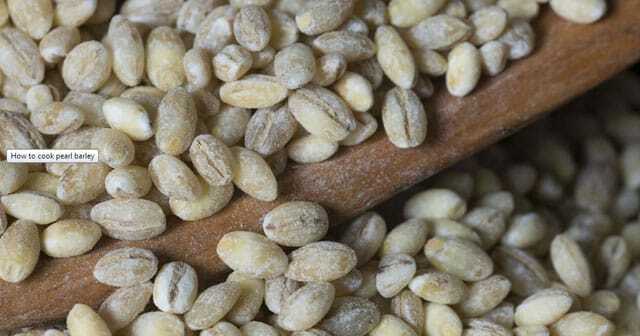 The texture of barley seeds is very distinctive with a taste like ordinary cereal. For those of you who want to experience this wonderful grain, you can find it in a food stall. Pearl Barley is well-liked for its high nutritional value. Now let’s see how to cook it. Cooking pearl barley is just like cooking other grains. However, for barley you should clean it with water first to remove the bran, especially if you add into the soup. The cooking process is usually by adding a barley grain directly into the broth or soup stew. If you follow this way of cooking, you need only 30 minutes to enjoy. In addition to the above methods, you can also try other ways with different variations. Another way to cook pearl barley is to make it as substitute for rice in risotto. Cooking time required is also considered the same. Meanwhile, if you want to put pearl barley into the soup but do not want to blend and thick it there. You have to cook separately, cook pearl barley in water for 30 minutes. Then cook the soup elsewhere. Once both are cooked, add the grains to the soup. So, it is the way to cook pearl barley with ease. This grain of cereal has provided many nutrients for health, especially fiber and minerals.